Can Sensory Design Improve Workplace Productivity? Designing for the senses might not be a new concept but in their latest 360 Magazine, Steelcase’s article on the topic offers a fresh take on why it’s important to consider in thinking about the way people work and the type of work being done in a given space. It details a comprehensive research study on the impact that designing for the senses has on workplace productivity and employee wellbeing. Italian firm Il Prisma, a Steelcase distributor, researched how the five senses affect people in an office – more specifically through employee wellbeing and engagement. They then used their results to develop a workspace around sensorial design. In their study, Il Prisma used EEG brain scans and eye tracking technology within different sensory-based spaces to discover what leads to differences in brain activity that may help people be more productive. The study not only found that workplaces focusing on the senses are better suited to improving wellbeing at work, but also helped them to create a method around how to personalize spaces for both the people working in them as well as the type of work being done. Usually the first sense people think of in terms of design, the simplest way to accommodate sight is to use color psychology. By using color purposefully, you can support the work people are doing in certain spaces. For example, blue hues are associated with calmness and would be best suited for spaces where work requires more thought, concentration and/or individual focus. Conversely, bright, vivid colors are more energizing and better suited in common and social areas. The sense of touch is most commonly described as how you feel when something comes in contact with your skin. In thinking about touch as it relates to office design, it can also be described as the presence of a variety of surface materials and textiles. By using a balance of textures throughout an office, spaces seem more inviting. For example, a meeting room with a reclaimed wood table with leather chairs, a hanging brass light fixture, artwork hung on the walls and potted plants is much more welcoming and comfortable than a meeting room with a glass table, plastic chairs and white walls. Incorporating some or all of these textural elements create spaces that inspire people to work. 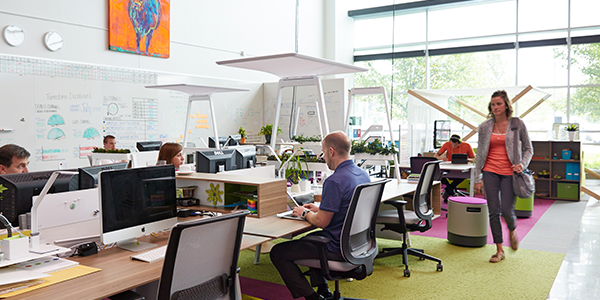 While the trend of shared workspaces and open plan offices promotes collaboration, one of the biggest complaints resulting from it is lack of sound privacy. Additionally, some researchers have found that productivity levels are significantly lower in the open plan. However, creating dedicated quiet zones and utilizing sound masking and acoustic materials can help nip these concerns in the bud. Smell is perhaps one of the strongest senses as it connects to the emotional and memory functions of the brain, and it can certainly have an effect on workplace productivity. Studies have shown that certain smells can increase alertness, thus positively impacting efficiency. If using scent diffusers is not an option, making sure unpleasant odors stay out of the office can also be effective. While eating and tasting might not directly relate to workplace design, the things people eat throughout the day can affect attentiveness. Most offices provide their people with coffee and tea—the caffeine in which can act as a stimulant—great for a wake up in the morning or an afternoon boost. Some offices provide lunches to their people but it’s better to eat a modest portion at lunch, limiting carb-heavy foods, so as to avoid a sugar crash. It’s also important to consider where people can eat within an office. Including a lunch room or work café is allows people to take a break and socialize with coworkers. Today’s offices demand a variety of workspaces that inspire and engage people. Il Prisma’s research shows that engaging one or more of the senses can improve concentration and learning. However, when designing for the senses, it’s also important to factor in the type of work being done in a space so that productivity and the sensory environment aren’t fighting each another. Anything from adding a few plants to designing an entire office around the senses works to improve employee wellbeing.